The writing is in the Kaisho style and was done by Yoshimi Yamada Maples. 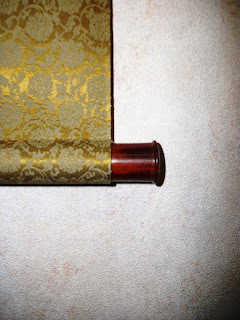 The brown Ichimonji was selected to match the brown decor of the room. The total scroll is about 6.5 Feet in length. This scroll is going to Europe. It was purchased as a gift from one Matial Artist to another. The phrase Ichinen can mean one thought or determined purpose. Possibly used as motivation to continue intense training in spite of pain or discomfort. This particular scroll is written in the Full Cursive style called Sousho, by Yoshimi Yamada Maples, whose Natori calligraphy name assigned by her Sensei is Ryugyoku. The cloth is a silk imported from Japan that has a very slight ivy pattern in it. 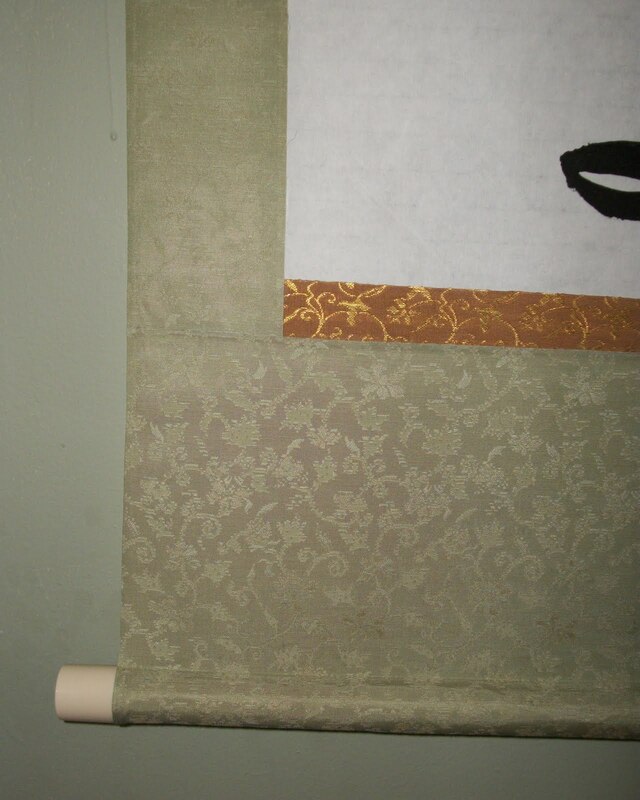 Because of the small pattern, I used a larger Karakusa (arabesque) pattern with the gold on cream ichimonji. Dimensions of the kakejiku in Bun (traditional Japanese measurement), Millimeters and then Inches. This scroll was one of the demo pieces completed for the person in charge of the program. It reads 百花春至 Hyakka ha Haru Itaru. This means that Spring Begins with a Hundred Blossoms. The writing was done is a Gyousho style by Yoshimi Yamada Maples, Ryugyoku. The scroll was on the drying board for over a year. The person receiving the scroll selected an Enshu Shitan Jikusaki. The scroll was designed in mind of the bonsaiist that loves to display shohin Azaleas. A pair of scrolls ordered from our neighbor to the North. The thing I like most about this order is that the customer knew exactly what they wanted and the entire order process only took about 20 minutes via phone to complete, and then it was hammered out pretty quickly. 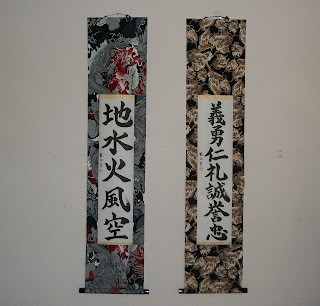 I have done several scrolls of the dragon in the 7 Virtues of the Bushido, but never in the Tiger cloth for the scroll. 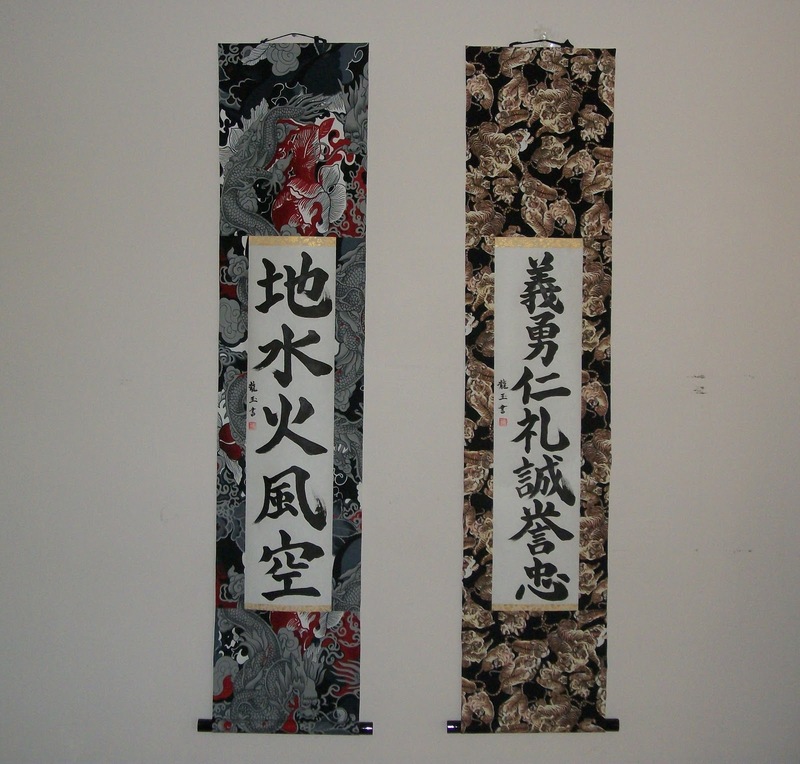 The scrolls are complemented with a Black lacquer wood jikusaki and a Kogecha (almost black) hanging string. This scroll is no longer for sale. Artist is Darlene Dihel. It was purchased by a bonsai artist at the Bonsai in the Bluegrass convention. This scroll is my favorite of the three. It is in the Fukuro Hyougu style with one suji in the Ten section and two suji in the Chi Section. I used the navy cloth to symbolize the night, along with the Kogecha kakehimo and black plastic Jikusaki to give the feel of night. The Orchid suji is used to contrast strongly with the dark cloth. Finally a scroll for a Judoka. This was ordered by a Judo practitioner in the Western part of the US. It has the writing in a kaisho style with Judo as the main large two characters and the two concepts which are taken from the www.wikipedia.org website. The scroll is done on a blue cloth with Gold on Red Ichimonji. The jikusaki is a Kokutan (Ebony) wood and the kakehimo is takuboku. This week, Yoshimi's Parents called to inform her that she was promoted to the rank of Shihan through her calligraphy society. I am proud of her diligence to submit her works monthly, and her large Joufuku work annually. Regina Oberndorfer was also promoted to rank of Nikyuu. She was in the top three of her cohort for the month of April.